Surprisingly early, spring seems to have arrived at the ranch. After a really short winter, the snow has almost vanished from around the ranch. Only the cold nights and snowy white mountain tops remind us that it is still February. However, everyone here is enthusiastic and ready to welcome spring as this is the time when we finally start riding the mountain tops again! 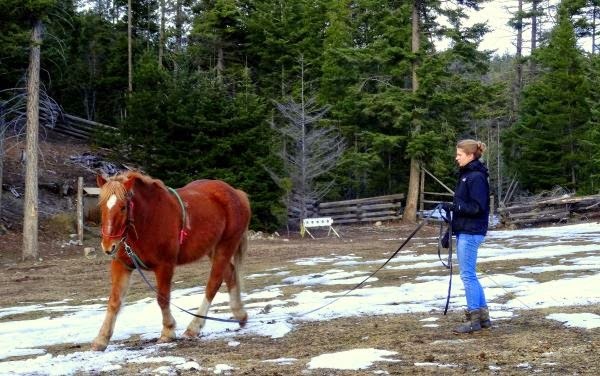 With the pack trip season in mind, we are getting our horses - and staff - ready for the eventful summer. 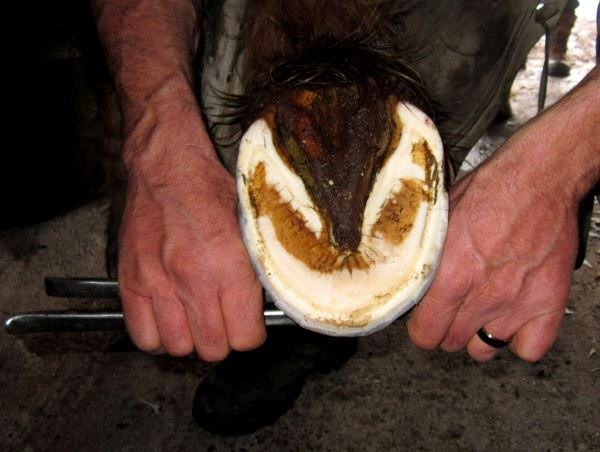 Two weeks ago, our horses got a complete medical check up, including teeth floating and hoof trimming. During their "winter holidays" our horses have been quite lazy: They were out in the pastures around the ranch, eating lots of hay and were only taken out for a ride when the weather and snow conditions allowed for it. To get them and us back into shape, we have introduced a daily work out: a run in the morning for the staff and a long reining session for the horses in the afternoon. It is also time for all our new staff including our esl student Lina, who has successfully completed her English classes and is now joining our esl Extended Immersion Program, to practice all the skills you need as a guide at our ranch. After learning how to trim a horse, we were shown how to pack a horse. As a guide you will always have to take a pack horse with you which carries food and other supplies for you and your guests. It is extremely important to learn the correct way of packing and securing all goods on the horse. Otherwise it will get sore and it cannot be used for a long time. 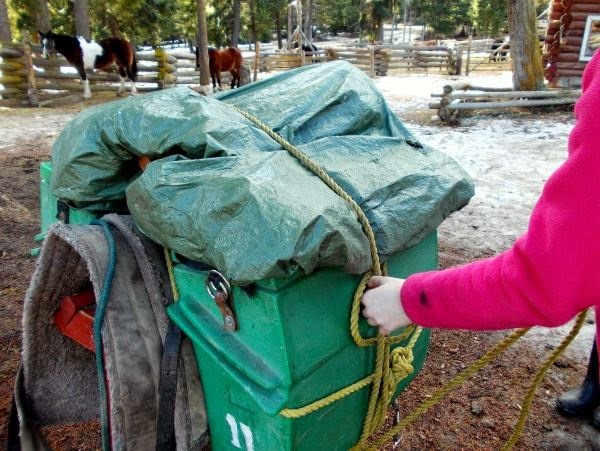 Packing boxes on a horse might seem easy but it requires a lot of practice and the right technique: From balancing the weight, to learning all the knots (the bowline, the barrel knot, the granny knot, half hitches and the 3/4 diamond hitch!) and finally covering and tightening the pack. If you are interested learning more about our esl Extended Immersion Program which is part of our esl package, have a look at our website!